For an organization that runs via a collaboration of hundreds or even thousands of individuals, authorization for access to the premises is paramount. In the past decade, digital door locking systems have emerged as an efficient tool to swiftly verify individuals as well as make a log of their entrance and exit. As the technology pertaining to biometric methods such as face and fingerprint recognition are harnessed further, the cost of the systems are expected to fall and become more affordable. On the back of mushrooming small and medium businesses (SMBs), the market for digital door locking systems is flourishing. According to the findings of this business intelligence study, the demand in the global digital door lock system market will multiply at a phenomenal CAGR of 34.7% during the forecast period of 2017 to 2024. 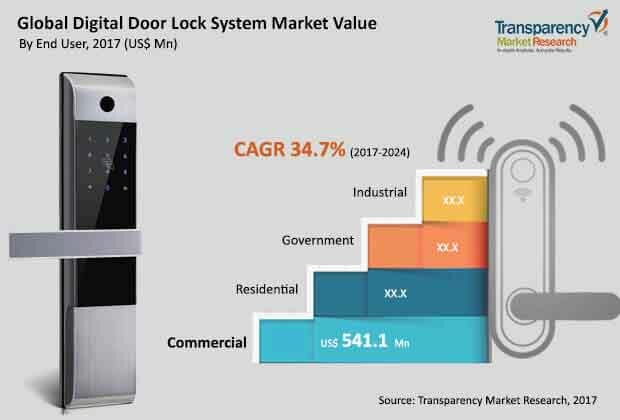 In terms of revenue, the digital door lock system market is estimated to generate opportunities worth US$11,230.0 mn by the end of 2024, incrementing significantly from the market’s evaluated valuation of merely US$1,481.8 mn as of 2017. Volume-wise, the study has foreseen a demand for 258,101 units of these systems by 2024. Apart from the commercial sector, the digital door lock system market is gaining strong impetus from the residential sector too. Urban populations are expanding in emerging economies and together with the developed countries, apartments and private properties are now getting equipped with these systems as they offers benefits of keyless entry and removes the need to lock the door after every single passage. Emphasis of governments to develop smart cities, increased disposable income of people living in urban parts, and growing popularity of Do It Yourself (DIY) are some of the trends that will pave way to new opportunities in the digital door lock system market. On the other hand, high cost and reluctance of populations to move beyond traditional locks are a few restraints moderately curtailing the prosperity of this market. Based on product type, the market for digital door lock system market has been segmented into biometric and keypad lock. The biometric segment, which has been further bifurcated into the recognition of fingerprint, signature, voice, palm, iris, and face, constituted for most prominent chunk of demand in the market as of 2017. By the end of 2024, the biometric segment is estimated to generate a revenue of US$8,110.7 mn. Among its sub-segments, fingerprint recognition systems were in highest demand as of 2017, but over the course of the forecast period, it is expected to lose a little ground to other promising sub-segments of iris recognition, iris recognition, face recognition, and palm recognition. By 2024, the fingerprint recognition segment of the digital door lock system market is estimated to be worth US$4,937.8 mn. Fingerprint technology is the most established and widespread form of biometrics, and is anticipated to dominate the residential and commercial end use sector in the digital door lock systems market. The main advantages of fingerprint technology is that it is the most economical biometric technology and its small storage space, reduced power requirements, and resistive nature to temperature and background lighting makes it an ideal technology to be incorporated into organization or apartment premises. On the basis of end users, the report gauges the potential of demand that can be expected out of the sectors of residential, industrial, commercial, and government. Among these, the commercial sector is anticipated to hold onto its position of most profitable end-user until 2024, despite losing share percentage to the residential sector. The major demand from the residential sector comes from new residential buildings and retrofitting in old residential spaces as awareness toward improving personal security is rising. Geographically, the developed regions of North America and Europe continue to provide for the maximum share of demand in the global digital door lock system market, estimated to collectively account for a revenue of US$6,541.4 mn, which will represent more than 58% of the total demand. On the other hand, Asia Pacific may be the third region in terms of profitability, the demand is primed to expand at most robust CAGR and the vendors of this market are suggested to make a foray in the emerging economies of China, India, South Korea, and Malaysia. By the end of 2024, the Asia Pacific digital door lock systems market is estimated to be worth US$3,162.7 mn. Growth of small and medium business and growing adoption among residential sector is driving this regional market. Siemens AG, Honeywell International, Inc., Hitachi Ltd., the ASSA Abloy Group, Cisco Systems, Inc., and Godrej & Boyce are a few notable companies operating in the global digital door lock systems market. The digital door lock system market report provides an analysis of the global digital door lock system market for the period 2017 – 2024, wherein 2016 is the base year and the period from 2017 to 2024 is the forecast period. Data from 2014 onwards has been included as historical information. The report covers all the prevalent trends playing a major role in the growth of the digital door lock system market over the forecast period. It also highlights various drivers, restraints, and opportunities expected to influence the market growth during the said period. The study provides a holistic perspective on market growth, throughout the above forecast period in terms of revenue estimates (in US$ Mn), across different geographies, which include North America, Europe, Asia Pacific (APAC), Middle East & Africa (MEA) and South America. The report provides cross-sectional analysis of the global digital door lock system market in terms of market estimates and forecasts for all the segments across different geographic regions. This research report provides in-depth analysis of the global digital door lock system market on the basis of type, end-use adoption, and geography. The report also includes competitive profiling of major players engaged in providing digital door lock systems. Major business strategies adopted by them, their market positioning, and various recent developments have also been identified in the research report. This report also provides market positioning analysis of major players operating in the digital door lock system market. This research study on the global digital door lock system market provides a detailed analysis of various type of lock systems primarily biometric and keypad locks. The report also offers an in-depth analysis of various factors such as market drivers, restraints, and growth opportunities affecting the market dynamics. These factors enable the analysis of various trends that would impact the market during the forecast period from 2016 to 2024. The report includes a comprehensive coverage of the underlying economic and technological factors under key trend analysis influencing the digital door lock system market. Furthermore, the report aims to provide strategic insights into the value chain analysis and porter’s five force model of manufacturers and distributors in the digital door lock system market. The market positioning analysis of key players throws light on the prevalent competition in this market.